Geert Wilders, Far-Right Dutch Politician, Found Guilty Of Hate Speech : The Two-Way The case is rooted in comments the lawmaker made at a 2014 rally, when supporters chanted that they wanted fewer Moroccans in the country. He then told them, "We're going to take care of that." Dutch parliament member Geert Wilders speaks last month in court in Schiphol, Netherlands, during the last day of his hate speech trial. A Dutch court has convicted far-right politician Geert Wilders of inciting discrimination, but decided not to impose any penalty. The case is rooted in comments the lawmaker made at a 2014 rally, when supporters chanted that they wanted fewer Moroccans in the country. He then told them, "We're going to take care of that." Thousands of complaints were then filed, ushering in this case. "Prosecutors, who rejected Wilders' assertions the trial was politically motivated, asked that he be fined $5,300. But the court refused," as NPR's Soraya Sarhaddi Nelson told our Newscast unit. The presiding judge, Hendrik Steenhuis, "said the court would not impose a sentence because the conviction was punishment enough for a democratically elected lawmaker," The Associated Press reported. The three-judge panel's verdict also "suggests that, in effect, Wilders and his party staged a stunt," according to the BBC. "Judges found evidence that they planned the remarks in advance and coached the supporters on how to respond. He had intended to insult, they said." 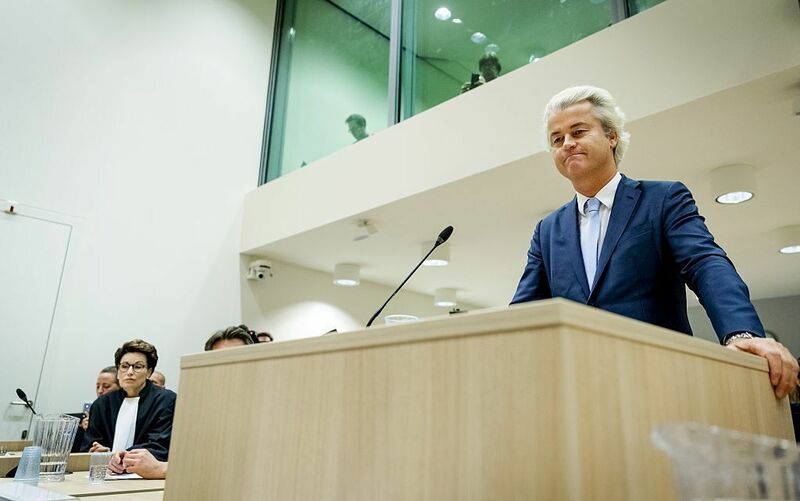 Wilders was not present in court for the verdict and swiftly released a video message decrying his conviction as an attack on his freedom of speech. He said he would appeal. "I have a message for the judges who convicted me: You have restricted the freedom of speech of millions of Dutch and, hence, convicted everyone. No one trusts you anymore," he said. However, the judges argued that there are limits to freedom of speech. "If a politician crosses the line, that doesn't mean free speech is being restricted," Steenhuis said, according to Reuters. "A crime cannot be protected by the right to free speech." Wilders is currently campaigning for re-election to parliament, with the vote scheduled on March 15. An appeal would likely continue through that campaign, as Soraya notes. Wilders decried the verdict as an attempt "to neutralize the leader of the largest and most popular opposition party." Wilders' Party for Freedom holds a narrow lead in nationwide polls, the AP reports, and has actually "risen in popularity during the trial." And according to the BBC, "the trial has provided the populist leader with the two vital elements upon which his party thrives — a platform to promote his political message and masses of media attention."